JACKSONVILLE, Fla. - The Jacksonville Jumbo Shrimp are putting the final touches on their roster for their opening homestand, signing Sgt. 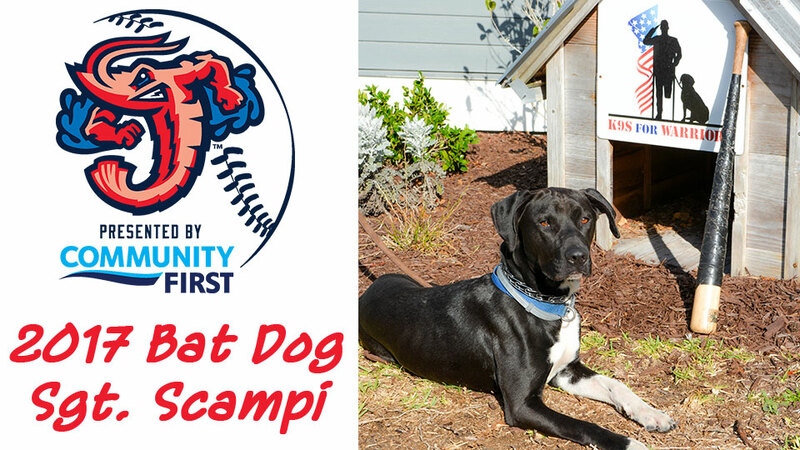 Scampi, from K9s For Warriors, as the team's bat dog for a designated half inning at each Friday home game during the 2017 season. Sgt. Scampi will make his debut at the Jumbo Shrimp game this Friday. Sgt. Scampi's addition is part of weekly tributes to military personnel on Red Shirt Friday. Those who wear red to the ballpark on Fridays may save $1 per ticket at the box office or donate the $1 to the Intrepid Fallen Heroes Fund. The Jumbo Shrimp also wear red "Bold City" jerseys to support military personnel. NAPA AutoCare Family Fireworks follow every Friday home game. "Sgt. Scampi brings special talent to the Jumbo Shrimp team, and our fans will enjoy his bat retrieving every Friday this season," said Jumbo Shrimp General Manager Harold Craw. "He represents a great organization, K9s For Warriors, and the military personnel they serve. We are excited to include them in our military appreciation promotions." The Jumbo Shrimp will continue to offer active military and veterans $5 reserved tickets to every home game. The team will also host three Military Family Appreciation Nights, when active military and veterans and their immediate families receive free general admission or reserved tickets. The nights are Sunday, May 28 (presented by Navy Mutual Life Insurance), Thursday, June 29 (presented by Navy Federal Credit Union), and Wednesday Aug. 23. K9s For Warriors, located in Ponte Vedra, Florida, helps veterans with PTSD and/or traumatic brain injury (TBI) have a new outlook on life. The non-profit group carefully selects dogs for their program from animal shelters across the country and professionally trains them at their facility. The dogs are then matched with warriors with whom they live, learn and bond together for three weeks before graduating and returning to home and family life. To learn more, go to their website at www.k9sforwarriors.org. "We are so grateful to The Jacksonville Jumbo Shrimp for honoring service members and veterans. Sgt. Scampi, his dog trainer, Frank, and the entire team at K9s For Warriors are incredibly excited to be a part of Red Shirt Friday this season," said Rory Diamond, Chief Executive Officer of K9s For Warriors. "We look forward cheering on the team and sharing our mission!" ABOUT THE JUMBO SHRIMP: With their home opener Wednesday, April 12, at 7:05 p.m., the Jacksonville Jumbo Shrimp are beginning a new era of affordable family fun with the 2017 season presented by Community First Credit Union at the Baseball Grounds of Jacksonville. With a new lineup of ticket and group options, there is a reason for everyone to get part of the action by calling the Jumbo Shrimp at (904) 358-2846 or visiting www.jaxshrimp.com.